The start of the year is always an interesting time when it comes to job movement. With the symbolic “fresh start” that a new year brings, it’s always the preferred time for candidates to start a new role; finishing up their previous commitments before the break and entering their new workplace refreshed and motivated. We noted in our quarterly update that last year was a big year for retention in our local market of Christchurch, with organisations going out of their way to retain their best people, and this is reflected in job movement numbers having dropped towards the end of last year – 19.41% of Christchurch respondents had been in their roles for six months or less, as opposed to 26.80% in our September survey. respondents had been in their role for six months or less – this time around, that number stood at 31.58%. Another thing we found is that the power of a new role is not to be underestimated. There were a number of significant differences between those who had been in their roles for six months or less (“new” employees) and the rest of the respondents. Perhaps most notably, new employees were more financially satisfied than the average respondents. 51.72% of new employees stated that financial incentives were their most enjoyed aspect of their role, as opposed to 34.45% for the rest of the respondents. Similarly, 79.31% of those who had recently moved into new roles stated that their salary met their expectations, versus 57.14% of the rest of the respondents. finances come first, then career opportunities take a back seat, as they’re aware that in a buoyant, growing market, the opportunities will come. It is important to note though that while those in new roles weren’t concentrated to any specific type of role or area of IT, there were a significantly higher proportion of contractors in this segment (48.28% vs 19.33% in Christchurch, 33.33% vs 19.45% in Auckland), which will have had some bearing on the results. While retention was the key focus in the Christchurch IT market in the second half of 2018, we also saw a significant increase in the amount of recruitment – likely in preparation for the new year. Where just 57.14% of employers surveyed in September had recruited in the six months previous, that number has risen to 76.47% in this survey, showing that there was a significant increase in hiring activity in the back end of the year. This increase in activity coincided with an increase in volume, with a third of employers having recruited for four or more roles over the last six months, and 72.73% of employer stating that they had no trouble filling any of the roles they had available in that time. employers see themselves hiring for IT roles in the next six months, an increase from the last survey’s 57%. However, this is still much more measured than previous years’ results where we were regularly seeing results of 80-90%. Software Development, Business Analysis and Testing/QA were cited as the areas most likely to be hired for by employers. the year is often sign-off season for strategies and new projects. perception of the importance of salary is fairly in line with that of employees. That said, 32.66% of employees stated that their salary is lower than expectation. With the results we have seen around new employees and the importance of financial incentives, it’s clear that staying on top of market rates when it comes to salaries can only have a positive impact. In our first report of 2018, we looked at the impact of gender in the Christchurch and Auckland IT sectors. This year, we’re revisiting those numbers to see if there has been any change, or if any trends have developed over the last 12 months. This year we saw a proportion of a women respondents that was comparable to 2018, with 22.94% of Christchurch respondents being women and 17.54% in Auckland. There was also little change in priorities and the most enjoyed aspects of their roles. professional development as a benefit, and this year we’ve seen that turn around completely. Where in the last report, we saw just 16.81% of women stating that they receive professional development as a benefit, this year that has more than trebled, and is actually higher than men in both Christchurch and Auckland. This is also seen in the number of women not receiving benefits, which has dropped from one third down to 11.44%. we saw 44.12% of women say that they felt their salary was lower than expected. This year, that number is much lower, at an average of 29.90%, including 26.47% in Christchurch, a number that is actually lower than the men’s numbers. Interestingly, some of this change could have something to do with the uptick higher number of women contractors that responded to this survey. Christchurch and 22.22% of men in Auckland. In comparison, last year, 31.42% of women in Christchurch were non-permanent employees. This may also be part of the reason that women are slightly more likely to look for work/life balance in their roles too. While we’ve seen some positive changes in this most recent survey, we are conscious that we have only been looking at this data for 12 months, and will continue to monitor trends in this area year-on-year and track progress. a slight drop in Auckland (from 26.32% to 21.50%). 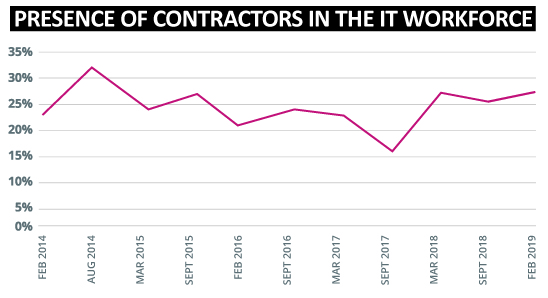 The last 18 months has seen very little movement in the percentage of contractors in Christchurch, showing that non-permanent assignments are perhaps becoming more of a consistent option for IT professionals, with less back-and-forth between contract and permanent roles. Thank you once again to everybody who participated in the survey and contributed to the Sourced Report. As always, we’ve been able to investigate a number of interesting trends and developments affecting the Christchurch and Auckland IT sectors, and we look forward to seeing what the rest of 2019 has in store. The new year is always an interesting time when it comes to recruitment, and looking into what sets those in new roles apart from the rest of the respondents gave us a great insight into the impact that a new role can have. employers both in the previous six months, and looking forward for the rest of the year. However, with those in new roles highlighting the importance of financial incentives, we’re interested in how the emphasis employers place on salary will impact their attraction and retention hopes. Finally, we saw some great steps forward in regard to gender equality in our most recent survey, and we’re excited to see whether this is somewhat of a statistical anomaly or more of a long-term trend.